Today we did our first retrospective since we changed to Kanban. These previous weeks have been quite interesting and it was time to improve our flow. The WIP limits were well respected. They raised bottleneck issues and by sticking to the limits, action did happen and the bottleneck got cleared mostly by helping each other out. Some team members who were experienced in Scrum missed the visualization of tasks that come with each feature. We agreed to go over a feature in detail with the analyst and designer when a developer pulls it from ‘Ready for Dev’ to ‘DEV’. This was not always done which lead to misinterpretations and eventually some rework. The team misses a planning meeting. It was hard to use the same ticket throughout the entire flow. Things got broken up once they entered development which made it more complex to measure flow. Instead of doing the classic daily standup, we now walk the board. Most of the time this takes us longer than it should be. We got rid of some buffers in order to maximize pull. When a feature reaches development it gets split into tasks and comes back to one feature when it is pulled into test and the rest of the flow. We visualize this with horizontal swim lanes and a WIP limit of 5 features. (The DEV WIP limit has increased to 5 because extra developers have joined). 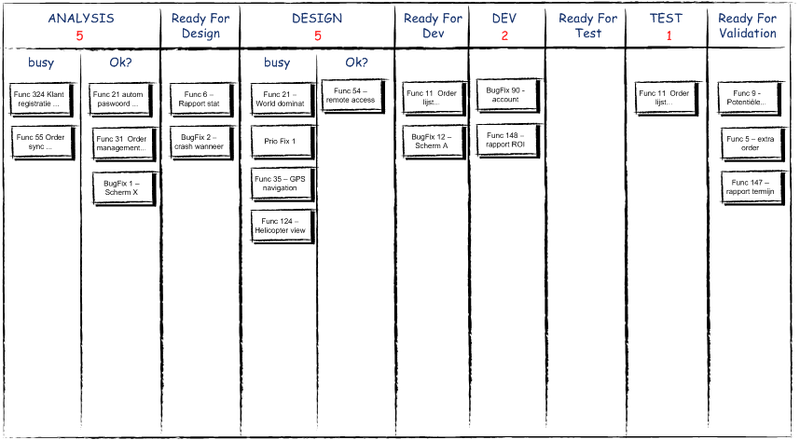 A planning meeting gets pulled when the ‘Ready for Dev’ column gets empty. At that time, we get together and plan the features that are in the ‘Proposed’ column. These have been analyzed, estimated (t-shirt size) and designed. We added a box for improvement ideas with a WIP limit of 3. When the limit is reached, we plan a retrospective. I noticed that without a regular sprint cadence, retrospectives tend to be forgotten (and if you know me a little, you know that I can’t really live without them). There are still a lot of things to improve. One of the most urgent is the visualization of progress. I’m looking if a cumulative flow diagram is sufficient, maybe combined with an SPC chart. If you got any good tips, please let me know. Great work! I’d indeed try the cumulative flow diagram. Or just start measuring the lead time for every story by writing start and end date+time on the post-it.